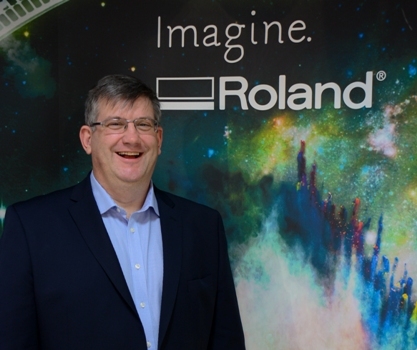 Roland DG UK & Ireland Sales Director, Brett Newman, promoted to Managing Director. Roland DG has announced that Brett Newman has been appointed to the role of Managing Director of Roland DG, UK & Ireland, effective 1 April. He replaces Jerry Davies, who after 14 years as UK Managing Director, has been promoted to the position of Managing Director of Roland DG EMEA. Newman has been with Roland for 14 years, starting out as an engineer and has over this time, held every major senior management position at Roland DG, including the roles of Product, Sales, Technical and Marketing Director. As the new Managing Director, he will be responsible for the company’s UK and Irish sales, service and marketing operations, retaining his position on the UK Board of Directors, and working closely with Jerry Davies in his new role as Roland DG EMEA Managing Director. And, it appears that there is also now more than one Newman determined to carve out a successful career in the industry. Mr Newman’s son, Gareth, has just taken up the mantle for the next generation, having recently secured a role as print operator, with Reflex Sales and Marketing, where he is responsible for running a Roland SOLJET PRO 4 XR-640 wide format inkjet printer/cutter. “It seems my passion for the industry didn’t stop at the door of the office. Over the years, I must have spent so much time talking up the industry out of hours, it’s convinced my son to join it as well!” said Newman. For more information, please visit www.rolanddg.com.